La Fee XS Suisse Swiss Blanche Absinthe is a popular Vermouth and Aperitifs available from DrinkSupermarket.com in 70cl to buy online. Visit DrinkSupermarket.com for the best price for 70cl of La Fee XS Suisse Swiss Blanche Absinthe or compare prices on our other Vermouth and Aperitifs products. This extra superieure Swiss absinthe is a clear 'La Bleue' with a smooth texture and delicate anise and herb flavour that lingers elegantly on the palate. It is best enjoyed by slowly adding three to four parts iced water creating a swirl of opalescent colour finishing with a beautiful milky white texture and releasing an array of intense aromas. Its perfect balance means that, as is Swiss tradition, sugar is not needed. La Fee XS Suisse is produced in the small town of Couvet in the Val-de-Travers region of Switzerland and it is here absinthe production began in 1792. Time was spent creating a recipe to reflect those top quality absinthes of the nineteenth century and the whole distillation process is carried out by hand and monitored closely to ensure consistency throughout. The finest aromatic plants, including locally grown wormwood (Artemesia absinthium), along with a grape alcohol base are carefully distilled in small quantities creating an absinthe that is highly elegant and perfectly balanced. Each distillation takes place in small copper stills that have the capacity to produce just over 100 bottles. The wine alcohol, herbs and plants, including the wormwood are soaked in the stills overnight resulting in a beautifully scented mixture. Just before the distillation process begins, natural spring water straight from the Swiss mountains of the Val-de-Travers region is added to reduce the alcohol levels. For many hours the stills gently extract the distillate, too fast or slow would alter the flavour dramatically. The distilled XS is now at 76% abv and is left to mature, after which purified natural spring water is added to reduce its alcohol level to 53%. Originally top quality absinthe was made using a wine alcohol base, after years of research La Fee teamed up with two of the most highly regarded distillers in France and Switzerland to produce two new and exciting absinthes; La Fee Extra Superieure. This X.S collection consists of two premier wine based absinthes that are hand crafted using original recipes and methods. Where to buy La Fee XS Suisse Swiss Blanche Absinthe ? La Fee XS Suisse Swiss Blanche Absinthe Supermarkets & Stockists. 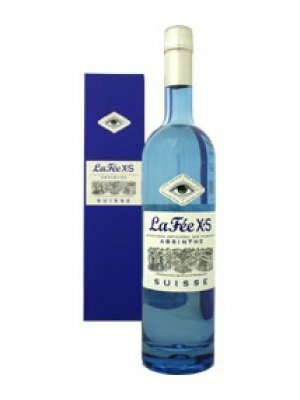 You can buy La Fee XS Suisse Swiss Blanche Absinthe online in most retailers and find it in the Vermouth and Aperitifs aisle in supermarkets but we found the best deals online for La Fee XS Suisse Swiss Blanche Absinthe in DrinkSupermarket.com, TheDrinkShop, and others. Compare the current price of La Fee XS Suisse Swiss Blanche Absinthe in 70cl size in the table of offers below. Simply click on the button to order La Fee XS Suisse Swiss Blanche Absinthe online now.